Innovative “green” strategies have revitalized Bridgeport and created a healthy, sustainable environment. Today, however, the 16-year-old spends every day he can there. The site has been transformed into the Reservoir Community Farm, a bountiful urban site run by a nonprofit on city land and staffed by 20 local youth interns. Torres-Sosa tends to vegetable beds, sells produce at a farm stand, takes school classes on guided tours and even offers customers advice on preparing kale or collard greens. In the meantime, he and his peers are racking up the skills and knowledge to be community leaders. The conversion of an eyesore lot into an urban farm is a two-acre success story that is part of a much larger, 1,100-acre challenge for this once-mighty industrial city. Twelve percent of Bridgeport’s land area is vacant—much of it contaminated former industrial sites, or “brownfields,” that have little value and pose health risks to surrounding communities. The overall strategy is known as BGreen 2020, a master plan that lays out a public-private partnership approach to attracting green jobs and businesses while reducing the city’s reliance on fossil fuels. The results have been transformative, but the city is far from finished. A scenic view of Bridgeport, Conn. from Pleasure Beach. Sliced by Interstate 95, Bridgeport is a diverse city, with Hispanics and African-Americans accounting for two-thirds of the population. It is part of one of the richest counties (Fairfield) in the country, but also ranks as one of the nation’s 10 poorest cities, with nearly one in four residents living below the poverty line. With 24 miles of coastline and a deep harbor, Bridgeport walked tall in the 19th century as an industrial giant and, in 1875, had a legendary circus showman for a mayor in P.T. Barnum. The city touted itself as the “arsenal of democracy” for the rifles and ammunition that poured from its factories; at its peak during World War II, the 600-acre Remington Arms complex employed 30,000 workers. But in a trend that hit the city hard over several decades, companies began closing factories and relocating jobs to lower-cost parts of the country. Today, a majority of the Remington land remains tainted, including a 25-acre lake that still holds remnants of old bullets and other explosives. But sections of the site are slated for rehabilitation. General Electric Corp.—which had a factory on a parcel of Remington land—cleaned up 17 acres and gave it to the city to build a new high school. DuPont Corp., which bought the arms-maker in 1980, has reclaimed another 25 acres for the city to use as a new rail station. The school and rail station will help revitalize the city’s East End. To the southwest, an underutilized industrial district has been transformed into Eco-Technology Park, home to a growing number of companies on the cutting edge of the green economy. The vast footprint of a former electric plant is now home to four new businesses, including a $70-million fuel cell power-generating facility—the country’s largest—that produces enough electricity for one-third of Bridgeport’s homes. The city has approved a plan for a private company to build a solar-panel farm on a former landfill. Other tenants include a company that turns cooking grease into biofuel, a manufacturer of paving products developed from old tires and a recycler that breaks apart old mattresses into reusable materials. 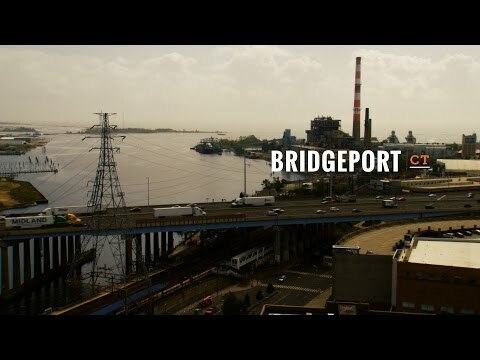 “These are the types of industries that not only are where the growth is likely to occur in our nation, but also the types of industries that will help to change the perception of Bridgeport from a gritty, post-industrial city to one that’s very much in tune with the 21st-century economy,” Kooris says. Innovative green strategies even extend to the city’s wastewater treatment plant, which is located within the boundaries of the Eco-Technology district and next door to the P.T. Barnum public housing complex. Rather than continue to send hundreds of trucks to New Haven to dispose of waste, Bridgeport is working with a Canadian company to develop a new facility adjacent to the plant that will use a so-called digester to break down sewage sludge, producing heat and energy in the process. When public housing residents initially expressed skepticism, the city, residents and other partners together arrived at a solution that would be beneficial to everyone: new greenhouses would be established, running on the heat generated from the digester, to provide fresh produce and potential job opportunities for residents. The city hopes the project will help the environment, while also bringing social and economic benefits to low-income neighbors, thus giving them a shot at better health outcomes. Kate Kelly, project director for the PT Partners initiative, says this is the type of collaborative thinking that drives growth in a positive way. A student during lunch time at the Lighthouse Summer program in Bridgeport, Conn.
A student draws while at STEAM camp at the Gary Crooks Community Center in Bridgeport, Conn.
To a build and maintain a local workforce, Bridgeport has re-focused its education system to address student achievement and growth from “cradle to career.” Recognizing the connection between education and health, the city has made a commitment to investing in access to early childhood education—with a goal of achieving universal pre-K—while elementary and secondary schools are paying more attention to STEM subjects: science, technology, engineering and mathematics. The Fairchild Wheeler Inter-district Magnet School, which is open to any student in the city via a lottery system, provides students with the latest equipment and tools to prepare them for biotechnology and information technology careers. The Aquaculture Regional High School is equipped with a simulator that provides students with hands-on training in ship navigation. Several schools—many of which feature energy-efficient, LEED-certified buildings—have conservation projects and gardens where students experience firsthand how to grow fruits and vegetables. “Building those healthy habits—physical, social and emotional habits—in students from the very inception of preschool can only make for a healthier city,” says Fran Rabinowitz, the Bridgeport Superintendent of Public Schools. For the parents of schoolchildren, the district offers quality after-school care at a minimal cost through the Lighthouse Program. Such a service serves the overall health of the community, Rabinowitz says, by allowing parents to earn a living without the extra stress of worrying about who’s watching their children. City leaders understand that for the new economy to succeed in bringing and keeping young professional and families in Bridgeport, safety is paramount; people need to feel secure in their homes and walking the streets. Bridgeport Mayor Bill Finch acknowledges that the city’s high number of illegal guns is a problem that needs to be fixed. “If the streets aren’t safe, it doesn’t matter how green your city is,” Finch says. The Bridgeport Police Department views gun violence as a public safety concern and a public health issue, particularly given that the city’s hospital emergency rooms regularly treat gunshot wounds. The police department is getting guns off the streets through a “buy back” program to incentivize the return of illegal weapons while partnering with community groups to address the underlying causes of violent behavior. A program called Project Longevity offers a deal to young offenders with long rap sheets for multiple violent crimes: If they pledge and follow through on a commitment to stop violent acts, they can get help putting their lives back together. That could mean assistance with finding housing, job training, educational help or addiction treatment. Another initiative, StreetSafe, tries to stop gang violence by sending trained workers into neighborhoods to mediate conflict. Early returns on these innovative approaches are promising. In 2014, violent crime in Bridgeport declined by 15 percent compared with 2013, higher than the statewide 10.8 percent decline over that year. In 1991, Bridgeport reported 62 homicides; in 2014, it had 12. A group of students at the Lighthouse summer program in Bridgeport, Conn.
A list of vegetables on sale at the Reservoir Farm in Bridgeport, Conn. There is no better place to see the revitalization of Bridgeport than among the sand dunes of Pleasure Beach. The barrier beach had been inaccessible to most people since 1996 when a fire destroyed a wooden swing bridge. The popular getaway became derelict and ghostly. The cost of repairing the bridge would have been prohibitive, so in 2014 the city came up with a less expensive solution: it built a new water taxi pier and added boardwalks, a playground and beachside pavilion with a snack bar and restrooms. Families have since returned in droves, but recreational activities are only one part of the new Pleasure Beach. Teams of local high school and college students serve as “Wildlife Guards,” explaining the beach’s functioning ecosystem to visitors and pointing out migratory birds such as piping plovers or osprey that can be seen nesting atop wooden poles. The education programs attract residents while students develop essential job and leadership skills. Sixteen-year-old Paris Jordan was born and raised in Bridgeport but never saw Pleasure Beach until she started working as a guard. “It’s a paradise away from Bridgeport, a peaceful environment,” she says. The beach’s redevelopment is a showpiece project in a new master plan for parks, the first in a century for the so-called “Park City.” Other projects include Knowlton Park, which sits on five waterfront acres on the Pequonnock River. A former industrial factory site, the area now features a playground, basketball court, fishing pier and gazebo. Bridgeport may be an old city, but from the economy to schools to the environment, it’s finding new ways of doing business around every corner, with better health at the forefront. How to create healthy corner stores from 2015 RWJF Culture of Health Prize winner, Bridgeport, Conn.